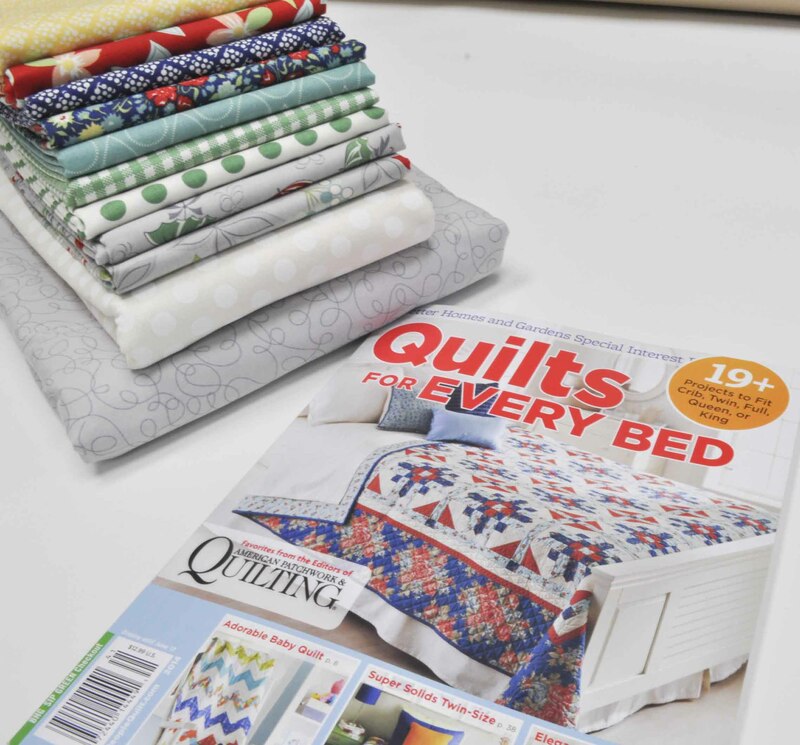 Moda has partnered with American Patchwork and Quilting to create a special interest publication, Quilts for Every Bed. Adorable baby quilts, super solid twin-sized quilts, elegant applique and super sized king quilts are throughout this special issue on newsstands now. Every page is full of detailed instructions and color options sure to inspire you. April has long been known for 2 things, April Fool’s Day and Tax Day. Moda along with Bonnie and Camille would like to add a third thing to the list, April Showers (not the constant rain) but the fabulous fabric collection in stores now. 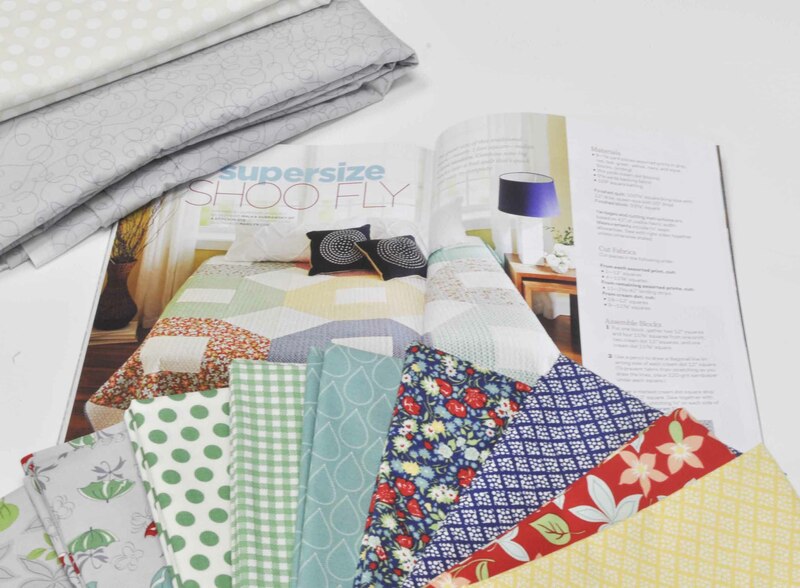 So to celebrate the special issue from APQ and all things April we are showering one lucky reader with a Supersized Shoo-fly quilt kit and magazine. We chose this quilt because it is big and thought you may be tired of crunching all the numbers on the dreaded tax forms. that is 100″ x 100″ that even your favorite IRS agent would enjoy. Leave us a comment telling us why winning this kit would give you relief. We will draw a winner at random and announce it here the morning of April 21st. Just winning the fabric would give me tax relief. What a wonderful give away. I would so love to win this quilt kit! I’ve made quilts for everyone else, but my husband and I sleep under an old shabby store-bought quilt. The colors of this quilt would surely give our bedroom a fresh new look 🙂 Now that I’ve done the taxes for everyone in our family, I could use a bonus! This would provide tax relief because, I would spend so much time working with these wonderful fabrics that I would not have time to stress over taxes. Just get them done and move on! After waking up to snow this morning, having made to through a terrible winter, and paying our taxes it would be just great fun to work with these beautiful fabrics. They look like a breath of spring. Hope springs forth. Great giveaway! I’m trying to collect fabric to start on my first quilt, but money is an issue, so this would be fantastic! This would relieve my emotional aches and pains of the self imposed quilty budget, which is next to nothing! And it would make a nice birthday present for me, my birthday was April 1st, no foolin! Winning this set.. wow! I think i would be in tears. Probably the first set of good tears ive had so far this year. This month is my birthday, and one of the hardest ive ever had. Family and finances took a turn for the worse this year, so needless to say. Its rough, especially with 3 little girls. These fabrics, april showers, would end up in a quilt for me. A comfort blanket to remind me that even in the rough and dark showers, flowers can bloom. It would be wonderful to win this kit and a great way to manage the stress of taxes. Oh wow, I would be relieved to have something work on while my husband studies every night! I love the fabric collection! Winning would be a wonderful gift after taxes and recovery from a broken leg! Love, Love this fabric. I’ve never made a quilt this large before. Winning this fabric might inspire me to tackle it. Boy oh Boy, I would love to win and make this quilt. I just told my husband today that I didn’t realize how stressed and depressed I get between Feb and April 15. Now that everything is filed I just felt a relief come over me. I’m ready to tackle a big project now. Thanks for the chance. I am currently laid off and with lack of income comes a lack of disposable income for fabric. I would love to win this giveaway so I can get back into the sewing room! what a beautiful line of fabric! If I were to win, it would give me relief in having a project ready to do (instead of having to gather together all the pieces …) and it would even look great on my bed! You did all the work and I can just make it! What pretty fabric! I am pregnant with my first baby and sewing is a great distractions from all the stretching, aches, pains, and kicks I get to experience all day. I’d be relieved to have a beautiful quilt for my king size bed! Thanks for the chance to win! Wow, enough fabric for a king size quilt! A beautiful way to redecorate my bedroom doing something I love, piecing and quilting! Since I was in the hospital in December of 2012 and almost died (coma for 12 days) I haven’t been able to do any quilting. I think this kits could get me back into the swing of things! Also, my husband lost his good job last year, then was on unemployment for 5 months, then got a part time job that doesn’t pay much. We are just getting by and my daughter and her family of 5 moved in with us for 3 months and that made things hard for us. But with love, we made it through. Again, I think April Showers kit would help me allot to bring my spirits back up. Thanks for the chance to win! I would receive relief because my youngest son will graduate from college in May and I can create a quilt for his success. What an awesome giveaway !! yes bed quilt for next winter ! I’m sure I’m not the only one who was alarmed at the amount I “owed” on my taxes! What a relief it would be to have a complete quilt kit that I didn’t have to pay for! What an amazing prize! I had to send the federal government a check this year (ouch!) so winning that beautiful fabrics would both make my happy and help my bank account! I would love to win b/c I still haven’t made a quilt for my bed! After crunching numbers for taxes what could be better than curling up under a beautiful quilt in such a soothing pattern? This would give me relief 1) because the fabric is beautiful….I love the umbrellas! 2) it would be something for me! been spending my early 2014 months making quilts for others. It would be fun to win fabric to make something for me! No matter the outcome…lovely fabric and thank you for the chance to win! Would love to win this kit! My anniversary is April 15th (I know right?) and it would relieve the pain of paying Uncle Sam every year on what’s supposed to be a happy day for me! I love, love, love April Showers collection. I am new to quilting & don’t have many patterns or fabrics. I would probably make it for one of my children. Love the April Showers fabric line! Making a quilt from those fabrics would give me relief from daily stress. Thanks for the giveaway! This is a beautiful quilt! It would take the sting out of the chunk of change we owe on our taxes and also the fact that it is snowing today after being 85 degrees two days ago! :). I would love to work on this quilt! Quilting for me is so relaxing- a great way to just enjoy doing art. Love the fabric! Yikes! What a great giveaway! Love the fabric! I would be able to pay my taxes and not have to pay for fabric. Bonus to win!! Happy Dance Time!! I would love to win this quilting bonanza! Now that tax stress is over, this would be a great stress reliever. Not only eo you have the beautiful fabrics already picked out but you also have the pattern. Winning that quilt would give me a gorgeous relief from a very long, very cold, very dreary winter! Hurrah for April Showers! This quilt would be fabulous fun!! It would be a relief not only from the whole tax thing but those bright beautiful colors would be so refreshing after the winter we’ve all had that just doesn’t seem to want to go away. We had snow again just yesterday! Thankfully, my husband takes care of the taxes, but I would love to make him this beautiful quilt to snuggle under. I would love to make a quilt for my little girl! What a nice give away. If I win, It will keep me busy and out of trouble.I will have a nice quilt for the end results. What a wonderful giveaway! We don’t get many “showers” where I live, these April Showers would be very welcome at my house! These beautiful fabrics would give relief from a long cold brutal winter here in Michigan. Thank you for the chance to win. I so much more enjoy reading quilting instructions than those ridiculous tax form instructions and of course I enjoy the outcome so much more too. The fabrics are fabulous and I would love to see the magazine. I would love to win this quilt kit and use it on our bed. I have made many quilts and have given them all away. This one would be for my husband and me to use. Thank you for the chance to win. I just mailed off lots of money to the IRS. I would love to have everything to make a a new quilt for my bed which I have shared with my best friend and husband for 39 years next week. I think that this new fabric line from Bonnie and Camille is so refreshing, just like April Showers. Would love to win! Jeanne nailed it when she spoke of the long, cold, BRUTAL Michigan winter. It snowed again last night and a quilt like this would go a long way towards reducing heating bills and increasing homey comforts – much like an income tax refund! This would be perfect for my son and new daughter-in-law in Atlanta! Would be awesome to win. Just ending a week with family. Need something to do to stop missing them all. Winning would give me relief from my husband! I still owe him a king-sized quilt for our bed and this kit has it all! I would love to win this April shower fabric. My mothers birthday was just this past Sunday and she passed away 2 years ago it would be a special quilt to do that I could remember her by . I also lost my mother in law and father all the same year only months apart so it would be wonderful to have a new special thought of the month to have happier memories . My mother also loved to quilt with my sister and I as I thought her a few years before she passed quickly. This would be a wonderful relief because it would give me a new project to do without costing me any money! I am new to quilting and am looking branch out and try something a little more detailed and this would be great! It would be more of a pleasure that a relief to have the fun of spending the summer working on this quilt. The fabrics are absolutely fabulous. Seriously, I love everything Bonnie and Camille and this magazine is so nice! I would adore this kit because so many of my quilts are for other people and it’s hard to justify another one for me. I would love to have a new quilt without the guilt. HELLO, yes this would surely be uplifting after a long winter+then tax time! Beautiful giveaway! Thank you for a winning chance! HAPPY SPRING ! I would love to make this quilt for my nephew’s wedding!! What a beautiful quilt and a beautiful give away! I love making quilts so much more than doing taxes! Quilting is such great therapy and full of friendship. Favorie tax agent??? oh no!! LOL I would love to make a new quilt for every bed. Shoo-Fly pie and Spring showers seems just perfect!! Winning this kit would help break me from the depressing of the enormous tax checks I just dropped in the mail this morning! The fabrics are so bright and fun, what a relief! Just starting a new project would keep my mind off of tax day and how much of our hard earned monies are going to golf trips! Winning this fabric would give me relief from stress, something to look forward to sewing, and warm my heart in the way of making a quilt. How do I spell refeif???? M-O-D-A!!!!!!!! I would love to win this quilt kit. It would look great on my bed! My favorite tax agent is my husband. I know he would love to have this quilt on our bed, especially if I won the kit. It’s gorgeous and I would love to make it. 20 yards of fabric, I would faint! It would be a big relief to think about something other than taxes. We own our business and filed the extension last month, personal taxes are done. We get NADA back and so to get something would be fabulous! Thanks! What am amazing wilt kit. I love everything about it! If I won I would need a nice cup of tea and a sit down. It would give my bank account a relief 🙂 Would love to win this! What a great quilt! I think it’s a relief that the fabric is already coordinated and picked out for me! I always spend more time than I should trying to decide what fabrics to use in a quilt. Thanks for the chance! I’m glad I don’t have to think about taxes for another year – except the monthly paperwork – Maybe I could do this quilt like a block of the month – right after the monthly paperwork. I’d love to make it and send you a picture next year! Winning this kit would take the sting out of the large check we had to write to the IRS. Well, after paying taxes, yet again, it would make it so I could quilt guilt free!! That would be a great relief! My beds need new quilts and this would relieve having to worry about it!! Sewing this quilt would be a relief from everyday stress. We are moving to a new home in a couple of months and this would be a wonderful quilt on our master bed. Taxes are just so complicated! My husband and I spent a whole weekend on it earlier this month. It was very stressful. And then today, the money we owed came out of the bank account. Ouch. When I’m feeling down, fabric always cheers me up. And winning fabric is the absolute best! Thanks for the chance! I have had a terrible cough for a month so this would be a lovely treat for me. I have made the mini April Showers quilt. For the second year running Uncle Sam has had his hand out to us when it comes to tax time, as a result of these large unexpected bills it’s looking like fabric buying is going to be taking a backseat to project making. I have been eyeing this great collection for a while but now it looks like my collection might be lacking it. I can’t say my taxes are very stressful for me this year but I do think this would be a wonderful quilt to make and donate to someone who could just use a bit of joy! I would love to win this. I work full time and am a part-time student. I set up an office in my sewing room so I do homework every night while staring at my neglected sewing machine and UFOs. I feel sad that I don’t have time to sew. Winning this would cheer me up in so many ways! AND, I would have a project to work on over the summer when school is not in session! I still have to do our taxes since they aren’t due until April 30th – no relief yet for me. I think I need some fabric relief! Actually I am working on a scrappy trip around the world using more than 250 different Fig Tree fabrics so I need relief also from choosing my next project and fabric. I would get relief from cold spots. The quilt on my bed is in tatters, and I could replace it. Winning this would give me relief after keeping my 4 year old granddaughter for a month, without being able to sew during that time. Thank you for a chance to win. I’ve been up to my eyeballs in taxes! I filed taxes for 5 family members! It would be a HUGE relief to go into my sewing room, close the door, open a package with a new pattern and fabric, take a deep breath (love the smell of new fabric) and get busy at my sewing machine. We have missed each other this month! You wouldn’t even need to send me the pattern. I just picked up that magazine the other day! And loved, loved, loved the shoofly! What a wonderful giveaway…I would love a new quilt on my bed. After having to pay federal and state tax this yr. (4 figures worth) I could use a tax break! PLUS, it is just fun to win! Thanks! I work for a CPA firm and this tax season has been a doosey am truly looking forward to a nicer schedule with more sewing time.Thanks so much for the chance !!! What a perfect way to do a quilt for our local Hospice. Since I had to pay both federal and state tax (in the 4 figures worth) I need a tax break! PLUS it is always just fun to win something! Thanks! Relief from having to choose fabrics and a pattern. It is all decided for you. How nice!! It would be a relief to not have to spend money on fabric after sending in $$$$ to the tax-man. I have completed everyone’s taxes in the family. Now this is for me. Would love to win this kit. WOW!!! I didn’t get a refund, so I’m hoping for a win. This will relieve my budget and allow me to make a quilt without needing money! Thanks. What a great prize. It would be great to have a new quilt to sew. I could forget all about my tax bill while making this quilt – I love those new Bonnie and Camille Fabrics and the quilt is beautiful. Would love to make this one. Wow, with all our medical this year, this fabric/quilt kit would brighten our year. Thanks for the opportunity to win. After mailing off my tax payment this afternoon I will not have money for April Showers and it is too cute. Love the vintage feel of those umbrellas. Thank you for the chance! I seem to always be making quilts for others and not for myself so it would be really wonderful to do something for me for a change. Oh so cute, I love everything Bonnie and Camille come up with! I would love to make this for a good friend! A perfect quilt to make for my son. Thanks for the opportunity. Great bright fabrics. Making a new quilt with these beautiful fabrics will be so much more relaxing than doing taxes. Fabric is always a relief! Love this giveaway! Happy Tax day. With those supersized pieces I might actually be able to finish that quilt in a reasonable time, which would give me relief from all the nagging from everyone I know about finishing projects. Like finishing is the most important part of quilting or something. I will eventually finish those other projects. Really. If I won this collection I would hold it as my reward for finishing next years taxes before April 15th! I love all things Bonnie & Camille and Moda. Winning that much gorgeous fabric would be a dream come true! Oh my, this is a wonderful giveaway….such beautiful fabrics! Since I won’t be getting anything back from taxes, this would really ease the pain! Thanks so very much for the opportunity to win! Oh wow! I would certainly love to win this! I am a CPA so tax day is extra special for me — it means the endless hours of overtime will stop for a few months. And that means I might actually be able to get some sewing time in. At least until mid-July, which in when the overtime kicks in again so we can get the returns done for all those that filed extensions in March and April. Pick me, pick me! I really need the pick-me-up! And the fabrics are fantastic! A dream come true. Last year was a disaster, and this year hasn’t improved much, but winning something would certainly bring a smile and stress relief. Quilting is my only stress reliever, and I surely need it. Anyone who has completed the agonizing task of figuring their taxes should be rewarded with something so lovely to wrap themselves in, soothe their wounds, and await spring in style! Loving this new April Showers line. Genius. Today is a very special day for me to remember because it was the day my Dad passed away. I still cry tears of sadness in my heart even after nearly 10 years. This wonderful quilt would be nice to make as April Showers truly bring new growth and beauty for springtime…and that’s something to be happy about! This would definitely give me Tax Relief! After what we had to pay, I may not be buying much fabric for a while. I’ve not done a super sized quilt – I mostly do baby quilts & throws – so this would keep me occupied for a while! Thanks for sponsoring this give away! These are showers I actually wouldn’t mind, it’s rained here almost non stop since last November! I recently lost my job & my DH is recovering from back surgery. Being able to make this wonderful quilt would give me emotional relief for many weeks. Winning this kit would bring me relief from doing farm work and give me a great excuse to get some sewing done! Winning this kit would give me relief from the long, cold, long, cold winter we’ve had with the great colors and big enough to fit our bed! Would be a relief to put this colorful spring-like creation on our bed… to replace the darker winter quilt we’re still using. And would be an inspiration to update the outdated window coverings too! 20 yds of fabrics,you´re very generous .I`d be pinching and thinking I`d be a fabulous dream that has come true.Thanks for the fun! Winning this would give me a tax relief for sure. I am on a limited retirement income and cannot afford to buy much fabric. So winning this would be fantastic!! That was my dream when I started quilting~ a quilt for every bed! I did manage that, and then continued to make quilts for our kids, but not for my bed~ which has such an outdated quilt on it, its a little embarrassing to say I quilt. This would be the perfect quilt to cover my bed! What a huge relief it would be to replace the old one and make the bedroom shine. Thanks for the chance! Great giveaway! I’ve never never tried to make a quilt that large. That would be absolutely great ! The relief would be having something to do besides thinking of my taxes, and something to keep me warm and cozy in case we get snow in Texas……yep not one snowflake at my house. Winning this would mean I could start making quilts and giving them to missionaries when they come to our church. We support many missionaries and I would be delighted to give them one when they come for deputation. Winning this would be like a breath of fresh air and a reward for all the stress that happens on tax day. Fresh pretty colors, Bonnie and Camille, super size and the magazine! It would be a relief just to have the entire package delivered, ready to go. Winning this would be a wonderful thing. I have never attempted a quilt this large, but it would definitely be therapy for me. I have a brand new baby grandson who has a heart defect and once we get through this and he is recovering, God willing, I could have this little thing to look forward to. I am a fabriholic & MODA is my favorite. Would love to win this beautiful assortment! I would love to win this because then I wouldn’t have to do MATH. I’m always too cheap to buy patterns so I try and figure them out myself and invariably get something wrong, and then I’m far too indecisive on what colors to coordinate… So a kit would give me a set project!! Winning free fabric….what better relief could there be? Raising a large family has stresses of it’s own…in addition to taxes!! But quilting gives me an emotional boost, so I would love to win this kit! Thanks for your generous giveaway! I would love to win this fabric! It’s gorgeous, and would match my room! Help, I’m an accountant and I’m absolutely drowning in numbers!!! Thank goodness it’s tax day. To make matters worse, I just did my own personal taxes and I OWE! Camille is my absolute favorite, I would love to win to ease my tax stress!!! With great sadness, we wrote a whopper of a tax check yesterday. Winning some luscious fabric and the pattern would help take away the sting. Even thinking about winning is good medicine. Thanks for helping to ease the pain. It had been such a stressful year it would give me great relief to sit quietly and sew. Nothing relaxes me more than sewing. We filed our taxes about 10:30 last night, so 20 yards of fabric and a fun magazine definitely spell R-E-L-I-E-F! Winning fabric would mean not paying taxes on fun fabric to sew. I sew Charity quilts but this fabric might have to stay home with me. Thanks for the chance! I live in the state of Washington, known for rain. I’d love to win the kit because I enjoy the umbrella print and the bright colored prints. I looked through the book recently at a quilt shop–love the variety of project. Thanks for a chance to win. How thoughtful of you to do a giveaway and include the backing fabric! What a relief to have all the fabric needed for the project. After having a record snowfall year here in the Detroit Mi area, and paying taxes April Showers would be a welcome change. After figuring taxes with a pen, I would gladly drop the pen for a needle and sew a quilt. Would love to win this awesome prize, thanks for doing this. How exciting. I have been eyeing this quilt pattern and this would give the the right opportunity to make it. Hope I win as April 21 is my daughter’s birthday and she would love it next year! This is amazing!! Like so many others, I do most of my sewing for other people but, if I won this, it’s headed right for my bed! I like that it’s a large pattern so it will go together quickly and (I hope) easily. I never mind paying taxes because I appreciate all the various services the government provides. It also contributes to building our communities. I would love to win this fabric. Being creative keeps my mind off what day it is. This would be fabulous to win. It would save me so much instead of spending so much to pay my taxes, and after doing taxes on all of our rentals, that would be a huge savings! Bless you for the relief! Moda, you are a welcome “relief”, tax or not !! I, like everyone else would love to WIN ! Winning would be a relief from the aggravation of having to send a big check to the IRS again this year. Thanks for the great giveaway. Sewing is my stress relief in general! Tax time just means more stress….I can’t sew fast enough! It would be a relief because my mom after a battling a long illness, passed away right before Christmas. So I had to prepare two sets of taxes this year. Actually, I had done it the prior seven years as her sight declined, and then her mind. I would love to make this quilt as I have never kept a quilt I made. Sewing is a stress relief for me! I’ve never made a king size quilt. Would love to tackle this project! I’m the wife of a CPA and winning this quilt fabric would be a wonderful way to celebrate April 15 as well as being able to see my husband more than just a few waking minutes each day!!! This would be a relief for me since I’m wanting to make my friend a quilt for her 50th Birthday and that would be a great kit and pattern! Who could be stressed when making a quilt with such beautiful fabrics? Winning would relieve all stress in my life! thanks for the chance to win! Winning this quilt would be a relief for me because I didn’t get a tax refund but had to pay a chunk. I need a nice treat and this would work wonderfully. I love the April Showers line, especially those adorable umbrellas. Great prize! I am a newbie quilter and it would be a relief to have more fabric and patterns/ideas to play with! Thanks! Would love this! I’m still trying to build a stash and this would make my husband happier lol. If would be a relief to win beautiful fabric from Moda and to have a new quilt project. This would sure take the sting out of the pressure of tax time. A new quilt project is the perfect way to regroup. Yay!! Winning this fabric would be awesome. I’m on fabric restriction right now and this would make my year!!! I attempted to make a quilt for my sister and brother-in-law for Christmas. I misjudged their bed size and it barely covers the top. They would absolutely love this! April showers would be wonderful to win. The April showers quilt kit would bring me sewing relief instead of focusing on the huge snow banks still lingering in my front yard. This would bring me the relief of not having to figure it all out on my own. A relief package! Love that! This would help solve my quilters block, I really need some inspiration. Yes, April Fools, Tax day and 2 days later my birthday! Surprise this morning to a layer of snow here in MI. I need a relief of it all – and a snuggle quilt to hide from the tax man! The quilt is just beautiful – thanks for a chance! What an awesome giveaway!!! It would be a “relief” to say that I have finally won some beautiful Moda fabric! I absolutely love it…and would so enjoy making something beautiful for our home. Love it! Such a beautiful quilt! Winning the kit would surely ease the pain of having to pay the tax accountant! Thanks for the chance. I would love to frolic in those fabrics and forget that the taxman has had his way with me!bwould love to play with them! tax time for me is very minimal – when you don’t have many numbers to crunch it’s a breeze, a good thing about not having much income. Meantime, I would love to win this wonderful giveaway and play with some of those fun fabrics – I have always wanted to do a large block quilt but generally keep to the smaller quilts. Wow, I would love to work on something for me! I am always doing something for everyone else and I would like a quilt for our bed. This would be fun and just the right size for our bed. I go to my sewing room to relax and unwind so to also work on something for me would be just GREAT!! Winning this quilt would be a relief for a person who lost everything in the Oso, WA mudslide. I would make and donate it to one of the families. Sally, this is so generous and wonderful of you! God be with those who have suffered in WA. Wow, this is an amazingly generous giveaway!!!! Winning this wonderful gift would be a huge blessing, because for about two years now I’ve promised my dear and devoted husband I’d make a large quilt for our bed. He truly gives so much to our family, and sacrifices so that he can serve our country in the Armed Forces. I’d love to bless him back. 🙂 Thank you! Thanks to your husband and you for your sacrifices serving our country! This would definitely relieve me of having to design a quilt for DD’s bed. She would get this one! This would be great – still haven’t made a quilt for our bed! Perfect king size, too. Wonderful. What a lovely way to give someone a bit of joy in their life. I am sure whomever you choose will be well deserving. As a newbie trying to learn quilting I find the cost of fabrics a definite drawback on my retirement. This fabric will be a real relief. I love all things by Camille Roskelley and would love to own April Showers fabric.Thanks for chance to win. I’ve just finished my first quilt. I’m new to the art so this would relieve me of having to build up a stock. 20 yards–wow!!! My oldest daughter is headed for college this year, with her sister following the following year. Wonder if 20 yards could make two cool college dorm quilts? Certainly would love to give it the old college try ! No tax relief or tuition relief in store for me in the next decade, so a free stash would be beyond excellent! Tax time is never pleasant. Winning this would make someone totally forget about taxes. The winner would be so busy looking/touching the fabric and reading/studying the book. How will it give me relief? These fabrics are great and really inspire me! That’s how! Fabric and quilting is always a great relief… and Supersized is even a bigger relief!! It certainly would be a relief to win this package so I wouldn’t have to worry about taxes for a while!!! Thanks for the chance to enter! I started working for an accounting firm on January 1st, so am just finishing my first tax season on the front lines! Quilting has always been my stress reliever and these fabrics would be a great way to have some fun after looking at tax files for three and a half months! Sewing with April Showers would give me such pleasure, a sure stress reliever! April showers would be preferrable to the April snow we had today! This would give me the chance to experiment and get out of my comfort zone! I like playing with fabric and challenging myself and this would do that! It helps me relax and “get away” from the world for a little bit. Winning this would give me much needed relief from trying to figure out what the perfect number of withholding exemptions is for us. My niece just announced her engagement. This would make a perfect shower gift, and after struggling through those tax forms, how nice to have everything all together to start my next project. After writing a check to the IRS I won’t be buying any quilting supplies for awhile! Winning this would be so wonderful and a nice relief for my quilting itch. I would love for something to be given back my way. Thanks! More fabric? Twenty yards? I’m blinking my eyes and rubbing my hands already. Oh the precious fabric! I love Bonnie & Camille fabric. I’m currently working on a King Size quilt using their Scrumptious line. If I don’t win it, congrats to whoever does. This prize would be a definite relief on my my purse or anyone elses for that matter. Thanks for an AWESOME springtime giveaway! This would give me much relief the IRS and also because of the snow we had today. Yes 4/15/14.. It SNOWED…I hate to say it, but I think the snow is worse for me then the taxes this year….. Either way, I could get lost in all that fabric and take my mind off these things. Wonderful! I love the pattern;) This quilt would be a relief because the bold colors and pattern would look great in our bedroom and I don’t think I’d even need to talk my husband into it! Wow–what an amazing kit! This kit would bring me relief–because dear hubby would be relieved that I didn’t have to pay for it! LOL Thank you for the chance to win. It would be great to win this wonderful fabric and put an end to a very stressful year! I love the looks of those fabrics – nice cool relaxing colors. To win something would be great. It would relieve me of looking for a new quilt, I could make one! I would love to win this amazing quilt! It is a great huge size for the whole family to cuddle under together! To win this quilt kit would be a great relief for me in several ways. First of all, it is a pattern that I like and one that I think very few people would be disappointed to receive as a gift quilt. Second, the fabrics are lovely; contemporary in design and color and by being soothing rather than overly dramatic, would be perfect for a bed quilt. Third, my nephew is 6’6″ tall, and sleeps in a king-sized bed with his wife of seven years. And fourth, I would finally be able to make them the wedding quilt I have promised them — for sure by their tenth anniversary, although I would hope sooner. And lastly, their two daughters are owed quilts also, and it would be fun to use a selection of April Showers fabrics to make two little girl quilts, as well. They are that adaptable! Winning would be a big relief for my small fabric budget. I even have a bed this quilt would fit. I would love to have some April showers fabric, but my current budget won’t allow it. It would be a relief not to have to scrimp for fabric! Love the colors and pattern. The umbrella fabric is fabulous!! It would be such a huge relief and blessing! I lost my job earlier this spring and after sleepless nights and anxiety filled days, I have found relief in sewing. Our finances have been a bit rough so that means less fabric purchases for me. I would like to eventually design fabric and quilt patterns and have found success on Etsy. I have been stressed out not just because of taxes, but of a lot of demands at work and in my personal life…winning this quilt kit woudl give me relief because it would give me a great excuse to hole up in my sewing room getting plenty of stress relief with one of my all time favorite pasttimes – sewing! And an extra bonus? My favorite designers happen to be Bonnie and Camille – love, love, love their wonderful collections!!! After paying my taxes I will have to stay away from quilt shops for a while. Winning this giveaway would be a huge relief ! Hurry up April 21st! This would be such a relief to me because I have been unable to health issues to work for a year, and have applied for disability, but it takes a long time. We have had no budget for me to quilt with, and I’ve used up most of my stash. Quilting gives me an outlet from the pain and worry. I have wanted April Showers so badly, this would cheer me up immensely. Thanks for the wonderful giveaway! Winning this quilt kit and magazine would give me a tax relief because the last few months have been hard. I have two friends who lost their husbands six weeks apart from each other.Finances are tight so very little to no money to spend on quilting. Winning would be a real blessing. Whoever wins is going to be one lucky quilter. Wow! It would be wonderful to have everything, all at once, to make that quilt! New fabric is always a stress reliever. Thanks. Winning would give me relief as I have a very tight budget each week and I usually do not have the funds to buy fabric very often. But, I like to make things for others such as quilts, bags and banners so free fabric would be great and patterns are always a plus. Thanks for a chance to win. The fabrics in this prize are scrumptious. Although I love the Seasons living in Colorado, I am so ready for some relief from the snow. April Showers would be such a joy to own and quilt with; would so be putting us in the mood for Spring and all of the beautiful colors it brings. Thank you for the chance to win this great prize. And good luck to all my fellow quilters and Moda fabric lovers!! Do not get a tax refund as I am disabled and recieve SSDI. Moda fabrics are so scrumptius to touch, the colors are so vibrant, and unfortunately the prices are out of my ballpark. I would love to be able to win and make the quilt, it would be an adventure. This would give me some relief in not having to buy the stuff to make a new quilt for my boyfriend’s bed! The dog has totally destroyed his!! I love, love Bonnie & Camille and haven’t bought this collection yet. What a relief to win it!! Thanks!! Winning this would be so awesome! As a mom of 4, I don’t have a lot left over to spend on fabric! Winning would relieve me of the decision of which UFO to work on next. I would have me a brand new project with all the fabric I needed. Thanks for all the inspiration. I love the APRIL SHOWERS!! Beautiful fabrics and a large quilt kit. Winning this would give me relief in deciding the pattern and fabrics to make a bed quilt for my daughter’s new home. Exciting! Winning this beautiful quilt kit would be a wonderful way to help make the events of this past weekend less stressful. My husband, two sons and I were just leaving my LQS when another car hit ours. I had not had a chance to fasten my seat belt so I was thrown into the dashboard and injured…the left side of my face and body is badly bruised and my left knee cap is broken. Luckily, no one else was injured. Our car is over 10 years old and will most likely be totaled….not the best of news since my husband has been unemployed for almost 2 years. We are just so thankful that no one was seriously hurt. Wow, what a great giveaway and something that would keep me busy and out of trouble!!!!!! Winning this amazing quilt kit would give me relief from my want for the fabulous April Showers fabric line!! Winning would give me relief BEFORE I start med school, would love to get in one last good project! It would give me relief from all the hours spent filling out my tax return. This would be fabulous to win. Fabulous quilt kit and magazine! The April Showers line gives me hope of more much-needed rain in California! That would be a great relief! I’ve been wanting to start a new quilt but couldn’t decide. I’d love the relief of having it already picked out! My taxes were done early so I could enjoy sewing. I have been waiting for just the right project to get April Showers. It would be a relief to win this kit and make a big quilt for my husband…then he can stop complaining about all my smaller projects which I enjoy doing! The man has NO clue how expensive it is to make king size quilts. As an accountant, April has special significance! This would give me what I need to tackle my first large project. A quilt this big would keep me distracted until tax time NEXT year! This quilt is bigger than my tax refund 😉 Sounds like relief to me! I can not really think of anything to say that would describe ‘relief’, even after reading many others comments. Clearly, so many would be delighted to have such a huge bounty of fabric. I am sure I would be nothing less that overwhelmingly awe-struck, if I were gifted this beautiful collection of fabrics. I do adore these prints, so much, I have a jelly roll waiting for me for on Mother’s Day, that my husband ordered. Makes me happy knowing it’s to be mine soon. I didn’t realize they weren’t taking tax out of my newly acquired social security check. 75% of my fabric budget is now sitting in the coffers of the Treasury Dept. Winning would be a wonderful equalizer ~ it would take me 75% of the year to complete this supersized April Showers quilt! it would be a relief to have yards and yards of beautiful free fabric to play with after the returns are done! I’m try this post again. Last time it generated a message that said server did not accept my comment. Tax Relief and Fabric Relief …. what a combination! Thanks for the opportunity! I would be relieved if I won this kit because I wouldn’t have to spend all that money to pay for all of that gorgeous fabric that I’m lusting over! Thank you for offering this giveaway! Wow! Winning would certainly help my “economic recovery” after what I had to pay in taxes. 🙂 thanks! That pattern looks like it might go together quickly and easily, and it would be a relief that it wouldn’t become another UFO! Enough fabric to make a quilt, fabric that sings Spring! How lucky can one girl be? I would love to win this kit. Thanks for the opportunity. Sincerely, Paula K.
Wow, I really could make a quilt for every bed in my house with that much fabric! It would be such a relief to add some beautiful colour to the house again! With working overtime the last two months, lack of fabric stash money, and general life craziness, my poor sewing machine is sitting very still and lonely on my sewing table. Quilting is my therapy and it would be a relief to make something beautiful! I would love to win this package because I just bought a new machine wit a larger harp size and signed up for a craftsy class in free motion quilting and I’d love to have this great kit to start out with! Receiving so much beautiful fabric plus a gorgeous magazine is a big relief on my pocket book. My stash is low, the winter’s been long, time to fill it up again. Thanks for a great giveaway. I would love to win these fabrics to make this quilt for our home. Pick me, please!! I have made many quilts for special people: all my siblings, all the newborns in the family, for needy children in our community, for fundraisers, for charity, and now for combat veterans. I now need a quilt for my bed for I have none to call my own. Thank you for the opportunity. After an absolutely horrible Winter we had this year, sub-freezing temps, 6 feet of snow, power outages (couldn’t use my machine! ), and recovering from major surgery (I’m ok) while living in the midst of a major reconstruction necessary after a pipe burst, snuggling under a super sized quilt made with Moda fabrics (my favorite) like this would make it all a distant memory. How fun! I just love those umbrellas. What an awesome giveaway. Having this kit to work on would take my mind off the rising taxes we pay and the worry over them, thus….tax relief or escape…for awhile! Thank you! It would be a relief to make a quilt that is all for me! Thanks for the opportunity. Yes, this is just one sweet give away and it would be a relief to have a kit put together without second guessing the fabrics. Have to say that is the greatest line of fabrics for any project and nice to work with. This kit would be a relief because then I could quit wishing for some of the April Showers fabric. I have been coveting it since Bonnie and Camille showed a sneak peek of it months ago. After such a long winter, just seeing this fabric makes me smile! This would make the blow from having to pay taxes much easier! I won’t be buying any fabric anytime soon & this would keep me in good spirits!! Wow, what a great quilt kit!!! Winning this kit would give me relief because I would have everything I need to make an entire quilt. No running out of fabric in the middle of sewing. Thanks so much for the generous giveaway! What a fantastic giveaway! This kit would give me relief because I didn’t get a refund this year and all the fabrics I would need to make a gorgeous quilt are included. This quilt kit would give me relief as I would no have to cut out any pieces, and I adore the fabric. Plus I had to pay this year, no fun! Budget relief. New fabrics come hard after retirement! New fabric brighten my day. A new quilt even better! I had to pay and this would be such a relief!! Love the pattern as well! This quilt kit would bring me relief because all the fabric is all picked out for me. I wouldn’t have to go to several stores to find them all. This quilt kit would give me relief from having to work with older fabric lines and scraps. My husband and I are retired and living on a fixed income. So for the last few years, I haven’t bought very much new fabric. I have been working from my stash and my scraps. It would be such a relief to work with beautiful new fabrics that coordinate so well. What a wonderful giveaway! I’d love to win this big quilt kit—my husband and 4 of my 5 sons are very tall! (the 5th one is only 4 so he isn’t quite up to his full grown height! They are always asking me to make a bigger quilt b/c the ones we have don’t cover them up all they way! I also LOVE the April Showers line and would so enjoy sewing a fun, big quilt with it. Thanks for the chance to win! Put backs on a few tops. Anytime quilting is involved there is relief from any of life’s stresses. Thank you for the opportunity to win this amazing quilt kit!!!! Winning this would give me relief, because picking the quilt design is sometimes the hardest part for me. I need some relief from this Minnesota snow STAT!! I think April Showers would be a nice cure for the snow storm we are experiencing today–I have the winter doldrums for sure and tax day didn’t help the situation. Beautiful spring colors….much needed after a hard winter. Our taxes are already done, but this quilt would go to someone to brighten up their life a bit. Thanks for the chance to win. After all this snow and yesterday breaking a record for snow and with my job working with numbers all day the relief of some beautiful fabric would be much appreciated. Thanks for the chance to win. I am the office manager for an accounting firm and we prepare close to 1200 tax returns yearly (20 years now) so from Jan. 1 to Apr. 15 I’m not even able to “look” at anything in my sewing room, although while I’m at work I daydream about what I’m going to work on when I get home. Unfortunately by that time of night I’m always too tired! I would love to win and actually be able to use these fabrics now that tax season is over (for 1 more year). Thanks for the wonderful give away! Thanks for the chance to win this quilt kit. Making it wil be relaxing and take my mind off of this year’s and next year’s taxes. WHOA! What a wonderful giveaway to brighten this gloomy month! I live in S.E. Wisconsin and we have had record snow levels and record cold temps this winter, this prize package would certainly usher spring into my life – here’s hoping I win! I am getting my son ready to leave for two years to live in Bolivia. This would be a great stress relief! I love this fabric line. Just touching that beautiful fabric would bring relaxation and relief. Thanks for the giveaway and the great collaboration on the magazine. What a relief it would be to have all the fabrics and the pattern ready to go. Gathering all the paperwork for tax day is always so stressful. Sometimes you just need something good to happen to brighten your life – and I could really use a “something good” this month! Winning this gorgeous giveaway would be AMAZING! Well after a very long winter (still -11 degrees celsius) and now a flood from the rain and thaw, I think this would bring a great relief. Thanks for the chance. I still have to file my taxes! So, this is a fun thing to do before I get back to the task at hand~ Love the quilt – and, the idea of a book on bedsized quilts. I don’t have one for every bed yet. Something I’d very much like to do. Winning this would bring me relief because I have always wanted to make an oversized block quilt. Thanks! I deserve to win this quilt because I moved and now get to pay taxes in both Canada and the united States, so if anyone needs tax relief, it’s me! Making this quilt would give me relief from returning to work after a career break to have children. Returning to work after 5 years is really hard and juggling school runs and everything else!!! I’m sewing for sanity! This is so amazing! What a fantastic giveaway! This kit would give me relief because sewing is my escape from all the stressful parts of the day. I would also love to snuggle under this gorgeous finished quilt! Thanks for the chance to win! I would just love to get my hands on that beautiful fabric & the magazine looks Amazing! Thank you for the chance to win! Hey..taxes are filed.and paid….what better thing to do with my spare time?? Tee hee. After a long dreary and extremely cold winter it would be such a relief to work with these beautiful and colorful fabrics! Thank you for this give away! What a wonderful giveaway! Taxes…yuck, yuck, yuck. These fabrics are beautiful! Thank you! Winning this collection would go a looooong way to relieve my (still!) winter blues. Ah! Tax pain. This would offer some relief. It would be wonderful to win this…we have a new house and I need a new quilt for our bedroom! WOW!! What a wonderful giveaway. Love the April Showers line. This would be a BIG relief and give me something to look forward to making. My daughter is getting married in Nov. What a great gift this would make. Thanks for the opportunity. It would be a relief to know that at least under my quilt there would only be April Showers and no more April snowstorms! Thanks for the chance to win, I love the April Showers line. Winning this would just be wonderful pick me up after the tax bill! Stress relief…it’s just the everyday grind of children, husband, job (teaching), dog, dishes, etc. it would be so wonderful to have a beautiful quilt to go snuggle under at the end of the day. I never can quite get to making something for myself, maybe this would get me to start. This would be a relief on my winter heating bill, and be used on my bed! It would be a wonderful relief to know that I can make something with this gorgeous April Showers line before it is unavailable. I have some but when is it ever enough for us fabric addicts? And to stitch up a super-sized quilt to show off those prints – YAY! Thanks for the chance! It would be a wonderful relief to work on just great fabrics! I love Bonnie & Camille’s fabric and would enjoy working with them again. Winning this quilt would give me relief because I need something for me right now. Been working on yearbooks for school, taking the kids to their after school activities, and cash is flowing out the door with no end in sight. Taxes. Braces for my son. Golf league. Travel softball. Soccer. Today is my birthday and I would love something that would be just for me. Thanks for the opportunity to win. Winning this kit would relieve my overburdened budget that never stretches far enough to buy all the fabric I want! Would love a new quilt for my bed for the summer……that would be a really refreshing relief……have been sewing with a few of the April Showrs fabric and love them. Trying to figure out how to pay for our first baby some April Showers would definitely bring relief! I am in love with this fabric line! Struggling with some major challenges right now. Winning would give me a positive boost and something to do to get my mind off my worries! I love April Showers. Rain, thunder and lightening are extremely good memories of the time I spent as a young child with my Grandmother. Bonnie and Camille are my favorite designers! This pattern would bring me relief from trying to put all those little blocks together. Plus the April Showers line is lovely. After a stressful military move from FL to Hawaii with our 1.5 yr old son, living in hotels for over a month and having water damage to our household goods that were shipped this would give me just the right amount of motivation to get back to sewing! I wake up always hoping the next day will be better, and sometimes it is. Winning this fabric would make my year! 20 yards of free fabric…sigh. RELIEF! Since we did owe taxes this year and it is raining, again, in western Washington state, winning this kit would mean I would have something to do inside! I love, love love this fabric. I would make the quilt to replace the tattered and torn store bought quilt (used for twenty years) on my bed. Then I would paint the bedroom a pretty color, and maybe I could get my husband to help me build some new furniture. We had to pay taxes this year so there isn’t a tax refund at all for us. This would help so much. Thanks for doing the give away! This quilt kit would give me BIG relief from having to use the store bought comforter my hubby picked out years ago!!!! Oooh, so beautiful! It would be a HUGE relief to NOT have to choose the fabrics! Looks like a great publication! 20 yards of fabric would be big relief for me to be able to start a new project! We are having some real april showers here in Seattle area! Well how can that not be a big relief! A supersize quilt would just be a major project! Whenever there’s trouble in the future I can just distract myself with this project, it’ll be quite a relief from daily stress! What an awesome giveaway! Having this fabric would allow me to make a nice quilt for my bed and it would relieve me from having to sleep under this sweaty, unbreathable polyester stuffed monster that I currently have on, it is just awful! Thanks for the chance to win and for the moments of daydreaming that just took place! It would be a relief to work at a sewing machine rather than my Turbo Tax! Owning our own business is awesome! But the tax part of it just stinks! We always owe and have never felt the joy of a tax return. This win would make me feel part of the, “tax return group!” LOL! It would be wonderful to win such a generous giveaway. I have read through the comments and there are so many lovely people in similar situations. I myself am not able to buy any of the new lines, including the coveted April Showers, so I would be over the moon. There was one comment that I did particularly enjoy and that was the one about the quilt made by a grandma for her first granddaughter before she was even a twinkle in her mama’s eye. My 12 year old daughter has already told me she’s never getting married or having children… but she’s still young and I’ve got time. So, I’m taking the idea away today and will one day make such a quilt too. What quilters wouldn’t be relieved to win 20 yards of fabric (especially “April Showers” by Bonnie & Camille). 20 yards of fabric = Stress free week. Beautiful fabrics – I love them all! Tax relief for me is getting to sew up some quilts. Since buying fabric isn’t deductible for me, winning it would be awesome! Thanks for the giveaway. This would give relief in the form of making. A new quilt to cozy up in everytime I need to feel relief;) what an awesome giveaway! This would be relief for me because my sewing machine is collecting dust and I need a new project to work on. I love the April Showers fabric line, as usual their stuff is gorgeous! This would be a huge relief to me to finally have the project and the pattern already sorted out! This would give me relief. I am a physician and work 10-12 hours days, weekends and many holidays. My relief from the craziness of my profession is to sew. I love sewing quilts. I do not have to think too much and it allows me to be creative. I’m in the process of making 100 Quilts for 100 Kids. This could go a long way and I could treat myself too. Oh this would be awesome!! I just bought a king sized bed but have no bedding for it yet. Winning would make me feel better about the money I had to pay! Winning this quilt kit would be inspiring, particularly because I adore Bonnie & Camille fabric and would love to use it for that “special” quilt. Thanks. I’m moving to the heat of AZ! I’d love to have April showers to remind me of home. Winning this kit would be the hint of spring i need after this morning snow and cold temperatures. It is a nice breath of spring. I would love to win, it would be as much fun to win as getting a tax refund! The colors and patterns of the fabric would provide such wonderful stress relit for me. And getting to snuggle under something I made would be the cherry on top. Thanks for a chance to win. Just getting to pet and look at the beautiful April Showers fabric would give me some happiness and relief from paying that large tax bill. Would love to make myself a new quilt for my bed. All my quilts go to someone else and I’ve never kept one for myself. It would be a relief to have this beautiful fabric as my bedspread. I have been searching for the perfect fabric and design for my King size bed. This kit would put all my searching to an end! The colors are perfect. I’d love some “tax relief” by winning this quilt kit. No refund from the IRS for us this year again!!! Love the magazine (I already bought it) and have been drooling over all the quilts. The April Showers fabric is adorable and we’ve had our fair share of rainy, icy, cold, and snowy weather. Sunshine will reign in sewing room if I’m the lucky winner. I’ve never made a quilt to fit my bed. So this would be perfect! Oh my! What a relief it would be to have the fabric for a new guest bed quilt. It would be gorgeous! Winning this fabric and pattern would be a relief to have such an amazing group of fabric ready to be cut into pieces to make a new quilt. Thanks for the awesome giveaway! After paying the irs, I could use this beautiful fabric to make a new quilt. Love this fabric! Wow, how generous. Winning this kit would give me relief because I already buy a lot of fabric and I wouldn’t have to explain it to my husband. Relief! Wow – I would have wonderful fabric to make a beautiful quilt – and a magazine with lots of ideas!! This is some of my favorite fabric ever. I don’t know about tax relief but I’d love to own some! I won’t bore you with the whiny details, but winning would be wonderful after a bad spell. Thanks for the chance! I’ve got some charm packs of April Showers and would love to add more material to make a queen sized quilt! Love it!! It would give me immense relief to win this giveaway because I would get to do my favorite stress reliever – PIECE A QUILT ! ! As Spring has approached, there is a fervor of stitching going on within our quilt groups … there is a spring in our steps after the rainy season … still another month or so to go. Cherry blossoms are bursting, daffodils are flowering … this would be a bonus ! I’m in the process of buying a fixer upper house and there has been a lot of decisions and worrying! Fabric will probably always make me smile and calm down a bit! I work for a public accounting firm, so indeed I would really enjoy some relief after tax season!! I would do so by sewing some beautiful fabric from two of my favorite designers. Thank you for such a generous giveaway! This would be a nice treat and relief on my budget. I would like to make my mother this quilt for mother’s day. I would love to win this because I just love the fabric and because I had to pay so much in taxes, I have no money to buy fabric…..
After paying taxes this year, it would be nice to be able to make something that I didn’t have to pay taxes on! And, the fact that April Showers is one of my favorite lines doesn’t hurt either 😉 Thank you Moda!! What a wonderful prize this would be if I had the honor of winning and it would be a relief to know I didn’t have to hide new material from the hubby cause it would be free!!! Wow! Tax relief would come in the form of me NOT buying 20 yards of fabric!!! 🙂 plus this line is amazing!!! Winning this quilt kit would give me relief from the fact that I lost my job last month and I had to pay taxes yesterday and those two things combined makes me sad. Bonnie & Camille’s happy fabric and this great quilt pattern would make me very happy! I would be relieved to have have lots of beautiful fabric to sew with without having to spend any money. Tax time is stressful. Thank you for hosting such a wonderful giveaway. I want to win. 🙂 Thanks again. Tax relief? It would make a GREAT 40th birthday present to me!!! I never made a quilt that I had all the fabric I needed. What a releif…not running out to get one more thing. Thanks for a chance to win! Winng this bungle I’d Spring into action and put the pedal [of my Featherweight) to the metal and have a Summer of fun making this Fabulus Fabric into a fancy-free Quilt. My hubby’s a CPA, it’s a relief to me that he’s finally home a little more to help me with our five kids! It would be a relief to win this because sewing is my ‘therapy’ and I haven’t had much time for my ‘therapy’ since Jan 1st! Had to pay taxes. I need some relief!! It would be great to make something for me. Thank You Moda!! Buying a new machine, need something to sew on! This kit would give me some relief in that I could actually begin a quilt without stressing over what fabric, which pattern, etc. I’d love to win! Thanks. Relief for me as I a promise to my family not to BUY any more fabric! Did not say I could not win any! thanks!! I belong to a Ladies Group that makes quilts and donates them to nursing homes and we also sell some to help support 3 missionaries. This quilt would be a great way for us to make more money for our group to help with our donations. We could sell it and have money for the Missionary cause and buy more batting for nursing home quilts. My CPA husband so looks forward to tax day every year, although it’s usually met with many extensions. I’ve told him he can work with me on my quilts and it will relieve all his tax burdens! Relief? That’s what quilting does for me…it gives me relief! Thanks for the chance to win this sweet gift. I’m really feeling the need for some sweetness right about now! I would LOVE to get this giveaway! I gave up buying fabric for lent!!!!! Winning this gorgeous fabric would be equal to the excitement I feel when I get a tax refund. Thanks for the generous giveaway. Anything from Bonnie & Camille is my favorite. Sewing is my therapy for lifes issues. Tax relief for my purse and at the same time relief for my mind in not stressing out over which moda collection I can’t live without. Wow! What an awesome quilt, with beautiful fabric! I am an English teacher and April is a month of being buried in research papers every night and weekend, so no sewing until mid-May. Looking forward to a new quilting project would be a great relief! Thanks so much for the opportunity! I love this fabric!! Winning this beautiful would be a welcome relief because we are self-employed farmers and always have to pay in, never a refund for us. Quilting is my therapy. What a welcome relief this prize would be! Fabulous fabric to chase the winter blues away! Bonnie and Camille and Moda always make a winning combination! Dread tax day every year. Love the colors and patterns in April Showers!! Whoop! Whoop! We have two students in college, so winning this prize package would be a fabulous relief for me. Bonnie and Camille are my favorite. Thanks so much. I am in love with April Showers. In fact I already had some of the line sitting on my window ledge as I watch the rain coming down right now. this would provide relief from my fabric fast!! After doing my taxes and writing the check, I could use something Beautiful like the quilt. April Showers is one of my favorite lines of fabric ever! And, I just finished serving as the president of the women’s organization in my church (for nearly 5 years) and want to make a quilt for me to prove that I have more spare time! Winning this would be a wonderful thing! I would not have to pick out the colors/fabrics. I would not have to visit the quilt shop, and end up spending *more* money on things I don’t need. Things I already have! Winning this prize would be the best reward for paying my taxes on time every year. Oh what a relief it would be to have it come with colors picked, fabric chosen, yardage figured, pattern picked, just everything. That would be a relief to me to not have to make any decision except to make this beautiful quilt. oh my!!! It’s definitely relieving when someone else has done all the work for you!!! Wow! I’d love to win this quilt kit!!! It’s beautiful. Wow what a wonderful giveaway. I love the pattern and the fabric. As a tax accountant this would be a great break from work!! This being THE YEAR I get Medicare, yea, so some relief coming I hope! After tax day, two root canals, and so much winter, ugh, I am so ready for relief! I’d have a milkshake and homemade cookies, but yipes, have you seen the price of milk? Ha, any relief involving a quilt would be wonderful, wonderful, wonderful! Keeping my fingers crossed to win!!!!! I would like to win this. Better than a tax refund!!! Oh my, you’re going to have a hard time with all these entries. It’s so kind of you to do this for all of us quilters. Thanks for the chance. I have a good life, with 8 children and 29 grandchrildren. I would like to make a quilt for each family. This fabric is really fun! Shoofly is my favorite quilt block and I would love to use this fabric. I am on the other end of the tax relationship as a preparer. It has always been stressful the last week because it is when the people who owe finally get their taxes done. I had to tell one person that he owed over 30,000. Oh my, I would have to sell one of my children, LOL. What a relief it would be to be able to make a quilt out of all those beautiful fabrics for our bed (especially after this past Ohio winter). After 37 years we are finally fixing up our bedroom and this quilt would be the perfect way to finish it off. Thanks so much for offering this wonderful give-a-way! Think that winning such a great prize would certainly take my mind off of taxes! Grand prize for sure! Thank you for the opportunity! this kit would make me smile after having to pay all those taxes. I will spend the time just thinking about how lovely this quilt is going to be…..giving me many happy days ahead. My health has been sorely taxed this year, and I ended up missing 3 weeks of work… it was so bad that I couldn’t even do had projects. I just love the April Showers fabric, and winning something would bring sweet relief to my weary bones right about now! I have been unemployed this last year. I didn’t even file taxes. I would LOVE to be able to work on a big project with some really great fabric. I haven’t been able to buy good fabric in so long, so that’s why it would be a relief! I would make it for my daughter’s bed. Thanks for the chance to win! Winning this fabric would be a relief as I can’t find it in any stores! I even road tripped 1100 miles last week, and it didn’t matter how many quilt shop stops I made, no one carried it! :'( I’d love to see the collection in person – especially since I have a few projects with which I think it would work beautifully. So happy you’re giving away fabric from my favorite designers! Thank you Moda for such beautiful fabric! I would love to be able to make a large quilt. Beautiful fabrics! We’ve had the same bedspread for about 9 years now and I’d love to replace it with a quilt. Unfortunately, I had to send my fabric budget (and a bit more!) to Uncle Sam yesterday! I have a stressful job and I find that the being in my studio is very therapeutic. I would love to spend more time there, but with three kids in university now, I am working my feet off. No tax refund here. In Canada we are taxed beyond belief. Buying fabric for a king size bed can be expensive – the relief is not having to worry about it! Second bit of relief is the big blocks will be easy to finish. Thanks for the awesome give away! I would be very happy and “relieved” to win this giveaway! I could give you the whole sad story, but that’s not my way. Just pick me! Pick me! Winning this would give me a great excuse to hide in my sewing house and forget about taxes. It is 30 here. I can’t believe Winter is still here. The Humming Birds came and the heat is still on. Poor birds. The relief would be it will distract me from my heating bill. I love Snowballs, that and Granny Squares are my 2 favorite Blocks. The colors are wonderful in this quilt, the yellow would let me at least pretend Spring is coming. Beautiful fabrics, it would be fun to work with them. A relief to not purchase them. I’m not self-employed so no taxes for me. It would give me relief from the horrible year that I’ve had though! Relief from lots of school deadlines! Glad tax time is over. Love the fabric. Pick me. Wow! This certainly would be a happy day to win the beautiful fabric and magazine! It would help to relieve the stress of this tax season and all that comes from this time in the school year. There are year end choir concerts, dance recitals, piano recitals, graduations to attend etc. Thank you for the wonderful opportunity to win my favorite fabric – April Showers! I would get tax relief by making this quilt because once made I could turn the heat down and put the money saved to pay my taxes. Winning this kit would be just the thing to give me tax relief. Then I could make a quilt and snuggle up under it and forget about taxes. I just love Bonnie and Camille’s fabric. Thank you for the giveaway. I would love to win this quilt so that my tall husband and I could finally sleep under a large enough quilt for our king sized bed!!! Thanks for the chance to win such a fabulous prize. It would be so fun to have a quilt kit in my stash that I didn’t have to pay for, that’s a good relief!! Love April Showers. Winning this quilt kit would be a relief from tax headaches. forced insurance, and a long winter. It would be a breath of Spring! Relief from buying the materials for a new project myself! Uncle Sam took most of my money. This would make me feel better and give me relief from more snow in MN! It would sooth my stressed and flustered self after going through filing my taxes, seeing my hard-earned money being taken away. Ahhhhhh. Getting “April Showers” would be better than getting a tax refund, and I appreciate Moda’s generosity in setting up this wonderful give-away. It would be a great relief if I finally win one of these giveaways!!! I love the colors in this line. Great idea for a magazine! Hope it is available on my newsstand…lovely giveaway. Is the giveaway open internationally? I’m in the UK, we don’t have a “tax day” like you do in America, but this kit would give relief from cloudy days and rain. I would love to win ANY type of giveaway and this one would be quite the windfall! Happy tax day and hoping to win BIG. WOW! What a great giveaway. Quilting measurements are the only math I’m good at…so this would be such a relief, to get away from the taxes and back to the math I know and love! This giveaway would be a great tax relief for me because I had to pay taxes and have no money to purchase this beautiful fabric. Winning this would be a fabric budget relief. It’s always diverting to fondle fabric and 20 yards is lots to fondle! Thanks! Not only would winning this kit be a huge relief to my quilting budget, it would also occupy me as I await spring and opening our lake cabin. Another foot of snow fell there yesterday, it seems like a warm quilt may be needed there year round. Thanks for the opportunity. Who doesn’t need tax relief. And, April Showers are always so welcome, because, where I am, we have April “Snow” showers! The fabric would be a welcome change. Holy Mother Lode, that would be a relief and I would split it among a group of girls who we do charity quilts together. A kit makes so much sense to me because I don’t have to try and find the fabric they used or find something else that works. I already love the pattern and the fabric so it’s a “winning” solution. This kit would give me relief because I would love to start a new quilt, but I have a small budget. I tend to pick up pieces here and there at sales and wait until I have everything. It would be so nice to have everything right away and be able to start when I have time. Oh my goodness, how I need some relief! Let me count the ways… 1. I just moved to Panama, where I have yet to find a fabric store that offers any decent fabric 2. I didn’t get one penny back on my tax returns, which means I can’t afford to buy any fabric online, much less pay the shipping costs to get it here 3. I love April and Showers!! It is my most favorite fabric line to date and 4. The rainy season will start here any day and April Showers ties perfectly into that. Thanks! I need some relief, to replace my current comforter, which my dog chewed a hole in! I would love to win this kit and make a new quilt. Winning this kit would give me relief because we have been getting what seems like recurrent April Fools Day with unwanted snow storms. I just need these April shower fabrics! Crunching the numbers cutting this beautiful fabric line for such a great quilt would definitely cure the tax time blues. Would love to win this-what great fabrics to play with! This quilt would be a gift to my daughter and her husband! Anything involving fabric gives me instant relief from the majority of life’s problems. 😉 Thanks for the chance to win! I have needed to make a quilt for my daughter, but we are so tight on money that daughter’s quilt kepts getting pushed to the back burner. I’m now tho them time that quilt needs think be done. But have no money. So this would be a get relief to win. I would love to win the quilt kit – it would be a great relief because I had to pay money in on tax day. If I didn’t have to pay in, I would have definitely purchased some April Showers fabric! I think winning this quilt kit would relieve me of the planning and purchase of the fabric for a fabulous quilt! I need to sew a quilt for my son and his wife and this would be so perfect. I would love to win this kit. I cannot afford to buy 20 yards of fabric so a win would be wonderful! We had a tax bill this year when we were expecting a rebate! So getting such a gorgeous bundle of fabric would be a great relief. My kids are now setting up homes of their own. They all seem to want large bed quilts! This would be right up my daughter’s alley. She is working on exams and has been really stressed, it would be such a delight to us both. Cuddling up in my favorite brand of fabric “moda”! I love the feel of moda this would be the perfect project & really look great on my bed! Winning this would give my spirits such a lift. This quilt kit would give me relief because I could finally make a quilt to replace the one with holes on my bed 🙂 Thanks for the chance. This would be a relief to win because I wouldn’t have to spend hours looking for a pattern and fabric… It is all included and lovely!! Thanks for the chance!! It would give me relief, because I need to sew a quilt to stay warm! It’s been the coldest and longest winter here in decades! And it’s STILL snowing! What a nice set of fabrics! It would be a relief to get some fabric for free and since a king size quilt is too large for my bed, I could save a “bundle” by using it to sew several items instead of one large one. The magazine is definitely an extra cash saving bonus. Thanks for the chance to win. I have a very strict $25 per month fabric and supplies budget, and with a broken washer and dryer going to the laundrymat has eaten up my budget so I haven’t been able to purchase anything recently. I have never made a quilt so large before, but I am excited to try! Thanks for the chance to win. We just bought a brand new (to us) King size bed on a whim (for a STEAL!!). Now we need new quilts that are big enough to fit it, obviously. Having the fabric and design picked out for me would be relief enough. Getting it for free would be incredible. My 4 sons have given me 8 grandkids in 5 years, I am behind on fabric and patterns for the babies and nursery items this would give me relief by helping me catch up and continue my play time on blogsphere. I would have relief again something great to blog about. It would be a relief to see this fabric sitting on my sewing table. Sewing up a beautiful quilt with it would be priceless! Thank you for the chance to win. After writing our tax check this week I will have to wait many months to purchase any new fabric. Winning this would be fantastic. I have been on a fabric diet since January 1. It would be a relief to get some new fabric!! Free fabric???? Im a beginning quilter and am building my stash. I’m absolutely addicted to this craft and would love to win this fabric. I have a family member bugging me for an enormous quilt… this would be the perfect opportunity! Thanks for the chance to win! That would be an enormous Easter Egg! It would give me so much pleasure to sew this precious fabric into a quilt! Rain clouds and deadlines and taxes, Oh my! What a relief it would be to win a prize from Moda! Winning the kit would be a big relief for me because I just finished an quilt for a customer and I’d love to make something for myself after all that hard work! I’m still learning how to put together fabric and picking designs so it would be a relief to have everything all picked out. Plus I could make one to actually fit our bed! This kit would give me relief because my bed is sorely in need of a new quilt. I could make a quilt for my guest bed without agonizing over pattern and fabric. Now that’s relief! This fabric would be some bright relief from the dreary winter! Just thinking of all the possible color combinations and fun quilts the fabric could be turned into…What a relief to have quality fabric to choose from. I just organized my quilting room. I need more fabric!! I also paid Uncle Sam… so needless to say, no fabric shopping for me for awhile. Lovely! I would love to win. Need some good news after taxes this year!!! I am such a chicken…I only make throws and have never made a big quilt! But I love this fabric line and it would keep me busy for awhile and let my wallet recover from tax time. Lol. I am relieved just to put winter behind me. I would like to win since I owe my son and DIL a bed quilt! It would jump start me! Ugh, we had to file for an extension to finish taxes and we owed more this year :(. I would make this quilt for a wedding present; I’ve got two to get done for this summer (so far). Did you ever announce the winner of this wonderful prize?